Guided imagery therapy is far more common than you might expect! In fact, its effectiveness is now so well documented that it is widely used in western medicine as an adjunct to modern healing techniques. Let's get to know a little more about how guided imagery is used today. Guided meditation is one area where modern science and ancient spiritual practices find some common ground. Guided imagery has been used for thousands of years by shamans and mystics around the world, but it also features in the more recent teachings of many notable psychologists such as Freud and Jung. In our modern era, guided imagery is the focus of a great deal of scientific investigation, and it is now widely used in the medical professions as an alternative healing technique. It is not a substitute for traditional physical or mental care, but it is often used to reinforce traditional therapies. In fact, scientific study on the effects of guided imagery and guided meditation therapy has been undertaken for conditions such as cancer, HIV, anxiety, wound healing after surgery, depression, memory, congestive heart failure, eating disorders, insomnia, pain management and osteoarthritis. "Of all the accomplishments that our hospital saw last year, the guided imagery program was certainly our most valuable." 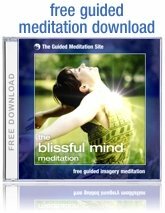 The use of imagery for relaxation and meditation causes the brain to release natural tranquilizing chemicals, which make guided imagery meditation a wonderful natural method for reducing stress related conditions such as headaches, high blood pressure and premenstrual stress, as well as a wide range of stress related psychological conditions as well. Given the fact that stress is one of the biggest causes of disease and illness, it's no surprise that guide imagery therapy, being such a relaxing and enjoyable form of treatment, is so effective and so popular!